Administered by McGill University in Montreal, the Cundill History Prize recognizes the best nonfiction history book in English. 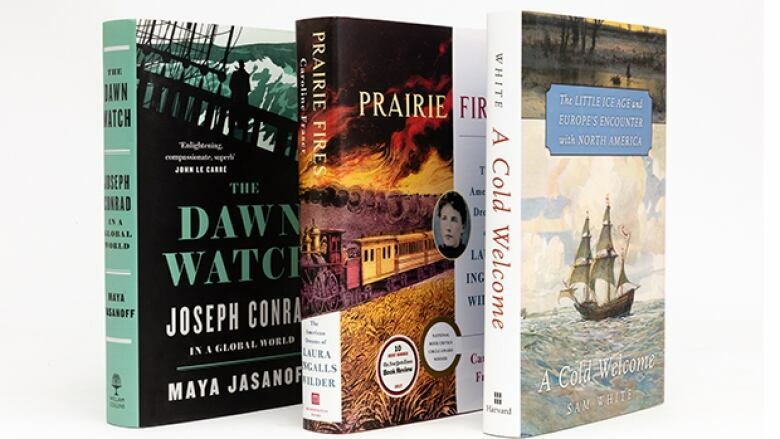 A biography of Little House on the Prairie author Laura Ingalls Wilder, a book on the legacy of Joseph Conrad and a book that looks at the historical impact of climate change are the three finalists contending for the $75,000 US ($98,124.00 Cdn) 2018 Cundill History Prize. Administered by McGill University in Montreal, the award is open to books published internationally and recognizes the best nonfiction history book in English. All three books on the 2018 shortlist are written by American authors. Maya Jasanoff's The Dawn Watch: Joseph Conrad in a Global World blends history, biography and travelogue as she follows the routes and stories of Joseph Conrad. Prairie Fires: The American Dreams of Laura Ingalls Wilder by Caroline Fraser is a comprehensive historical account of the life of Laura Ingalls Wilder, author of the Little House on the Prairie books. A Cold Welcome by Sam White takes a historical look at the role the climate played in the success and failure of the first North American settlements. "Going beyond traditional, straight-forward history, the finalists... are works that move the genre of history writing forward," said historian Mark Gilbert, the chair of the jury. The winner of the prize will be announced at a gala event on Nov. 15, 2018 in Montreal. The two finalists that do not win will each receive $10,000 US ($13,083 Cdn). Last year's winner was British historian Daniel Beer for The House of the Dead.